This June, we released usage metrics for reports and dashboards in the Power BI service. The response has been tremendous. Usage metrics has already been used hundreds of thousands of times by report authors to measure their impact and prioritize their next investments. Since release, by far the biggest request has been for a way understand which users were taking advantage of your content. You asked, and we delivered. Today, we are excited to announce that we’re supercharging usage metrics by surfacing the names of your end users. And of course, you’re free to copy and customize the pre-built usage metrics reports to drill into the data. The change is currently rolling out worldwide, and should be completed by the end of the week. This simple change has the potential to magnify your impact like never before. Now, you can understand exactly who your audience is, and reach out to your top users directly to gather asks and feedback. Excited? Read on for a walkthrough for what’s new in this update of usage metrics. Going forward, when you go to dashboard or report usage metrics, you’ll also see a breakdown of number of views by user. The visual includes the display names and login names of your end users. Note: if you have an existing personalized copy of the usage metrics report, you can continue using it as usual. However, you’ll need to re-personalize a copy to get the new per-user data. With the “save as” feature, you can copy and customize the pre-built usage metrics report to further drill into how your end users are interacting with your reports. In this release, we’ve augmented the users dimension with display name, login name and the user’s GUID. Once you copy the report, you can remove the pre-set dashboard/report filter to see the usage data – including usernames and UPNs – for the entire workspace. Tip: the UserGuid (aka Object ID) and UserPrincipalName are both unique identifiers for the user in AAD. That means if you export the usage metrics data, you could join the usage metrics data against more data from your directory, like organizational structure, job title, etc. For a full overview of usage metrics and its capabilities, read through our documentation. As an IT admin, we understand that you may be tasked with ensuring that Power BI remain compliant with a variety of compliance regulations and standards. With this release, we are giving IT admins further control over which users in their organizations can take advantage of usage metrics. 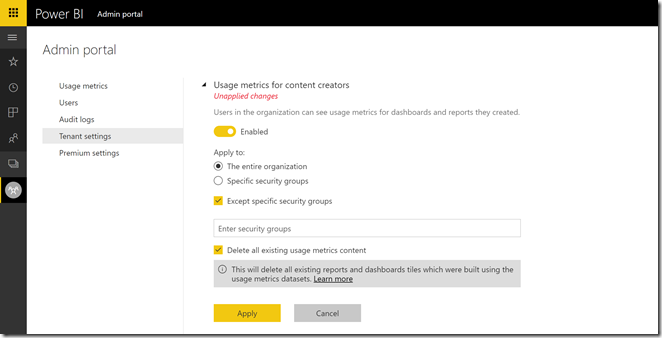 The usage metrics admin control is now granular, allowing you to enable usage metrics for a subset of your organization. In addition, a new option in the admin portal will allow you to disable all existing usage metrics reports in your organization. Together, these features give you full control over who in your organization can use usage metrics, regardless of how it’s currently being used. For example, if you have users taking advantage of usage metrics, yet would like to control its rollout, you could delete all usage metrics content for users to start with a blank slate. From there, you could enable the feature for an increasing set of security groups as the rollout progresses.